Any time I need to roast vegetables for a recipe, I do it the exact same way. It’s very simple, but packs so much flavor that I guarantee you will make this more than once. These vegetables are great by themselves, topped with parmesan cheese, mixed with pasta or rice, on a pizza, etc. You can do anything with this recipe! Chop all of your vegetables into bite size pieces, about 3/4 of an inch long. Mix all chopped veggies in a large bowl. Set aside. Mince all three cloves of garlic, place in a small bowl. Add olive oil, vinegar, sugar, and all spices to the mix and stir until sugar is well absorbed. Pour the marinade into the bowl of veggies and mix well, making sure that all vegetables are well coated, and spices/garlic aren’t concentrated in one area. 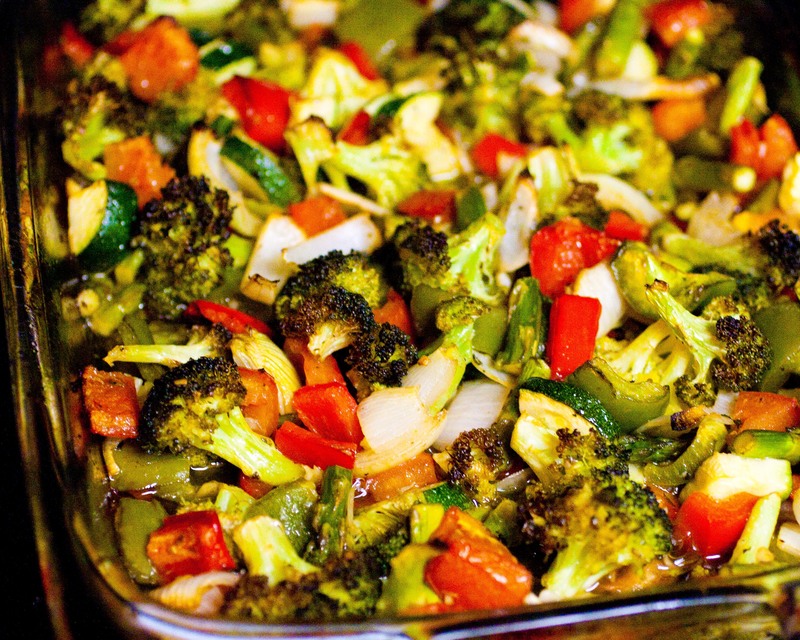 It is not necessary to let the vegetables marinate for hours, but the flavor is that much bolder if you do. I would marinate for about 3-4 hours, mixing the bowl every 1/2 hour. Spread all the vegetables evenly in a 13 x 9 glass baking dish. Pop in the oven for 30-40 minutes, or until the tops of the broccoli are looking browned, and all veggies are tender. Top with grated parmesan cheese, mix with your favorite pasta, rice, or eat them by themselves!